(Nanowerk News) Implanting artificial materials or devices in patients can cause adverse reactions when contacting natural tissue and blood. In blood-related defense mechanisms, plasma proteins quickly adsorb on the biomaterial surfaces and trigger a series of biochemical events that lead to platelet adhesion and aggregation into blood clots. The clotting can hinder the performance of an artificial device and can be life-threatening in some instances. Now, Isabel Rodriguez from the Institute of Materials Research and Engineering of A*STAR, Singapore, and co-workers have discovered that adding miniature topographical features to polymer surfaces can reduce blood coagulation and improve the ‘hemocompatibility’, or blood compatibility, of biomaterials ("The effect of topography of polymer surfaces on platelet adhesion"). Using chemical modifications, many researchers have tried to coat or graft a secondary material to the surface of biomaterials to enhance their biocompatibility. Attempts to date, however, have met with limited success. In many circumstances, secondary materials can leach out from the modified surfaces, which may have toxic effects, according to Rodriguez. “Hence, a biocompatible surface without additional chemical modifications is most desirable,” she says. To achieve this goal, Rodriguez and her team prepared various nano- and micro-structured surfaces from the biocompatible polymer poly(lactic-co-glycolic acid) (PLGA). 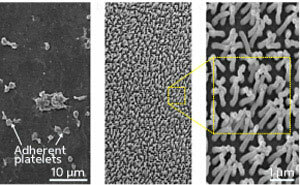 They used alumina and silica templates prepared using nano- and micro-fabrication techniques to create nano- and micrometer-sized cavities. They then deposited PLGA solutions into these templates and cured them under vacuum to produce the structured polymer films. Next, the researchers incubated the surface-structured PLGA films with human fibrinogen—blood protein that mediates platelet adhesion and activation—and then with platelet-rich plasma. Finally, by quantifying fibrinogen, platelet adhesion and platelet activation, they assessed the ability of the films to promote blood clotting. Significantly fewer platelets adhered to surfaces covered with dense, high aspect ratio, nanometer-sized features than to planar surfaces (Fig. 1). From a comparison between a featureless PLGA film and an inert carbon surface, the researchers found that surface chemistry had an important role in the initial adsorption of proteins and platelets. However, appropriated surface features can overcome or complement the effect of chemistry and indeed reduce the tendency of blood clotting on an artificial surface, notes Rodriguez. “Surfaces with [a] high level of hemocompatibility will have important applications in surgical tools such as catheters and implantable medical devices like heart valves, stents or vascular grafts,” says Rodriguez. The team is currently planning to perform in vitro tests using whole blood samples, instead of just plasma, to assess clot size formation and clotting rate before moving on to in vivo tests.